Tours begin at 9.10, 10.30, 11.00, 11.30, 12.00, 12.30 and 14.00, daily, except Sundays. Visit early to avoid crowds. We are comparing Florence: Duomo Guided Tour and Reserves Cupola Entrance Prices from leading ticket suppliers and Try to find you Cheap tickets prices on the market. Filippo Brunelleschi's magnificent dome topped cathedral was an architectural masterwork which took nearly 200 years to complete. Today the Basilica of Santa Maria del Fiore, the Florence Cathedral, is still one of the most beautiful Catholic Cathedrals in the world and the number one attraction in Florence. Every year thousands of visitors pour into the famous cathedral for a glimpse of its richly decorated interior. You will meet with your guide outside of Florence Duomo and begin the tour with a visit to the Baptistery of St John, hear the history of one of Florence's oldest buildings before continuing to the Cathedrals museum. Inside the museum is the home of an extensive collection of artworks by renowned Renaissance artists. This includes the brilliant Michelangelo and Donatello. This 2.5-hour tour also gives you access to climb to the top of Brunelleschi's dome and enjoy stunning city views from Giotto's Bell Tower. 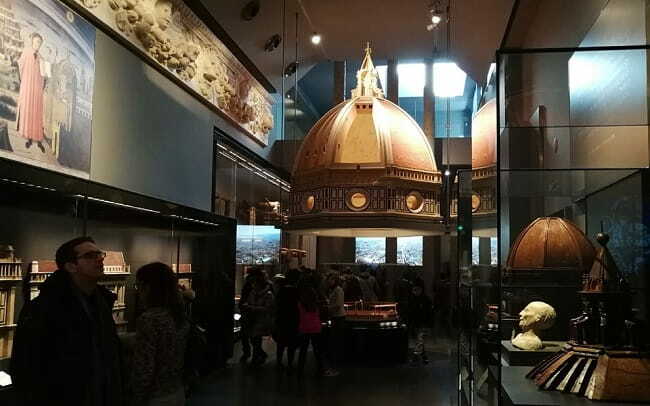 If you want to learn about one of the greatest architectural works in the city then a visit to Brunelleschi's Dome is a must. Suitable for small groups, friends and families. Your Experience With Florence: Duomo Guided Tour and Reserves Cupola Entrance? Discover one of the highlights of Florence on a 2-hour guided walking tour. Improve your city knowledge as you discover Florence with a bilingual tour guide. Enjoy panoramic views over the city from Brunelleschi's Dome and Giotto's Bell Tower. Take stunning cityscape photos as fun selfies with your travel companions. Get full access to this iconic cathedral, the Crypt, St John's Baptistery, Duomo Museum, Bell Tower and Dome. What Florence: Duomo Guided Tour and Reserves Cupola Entrance Includes? All entrance fees including reservation tickets to the Giotto's Bell Tower and tickets to climb to the Cathedral Dome. 2 hour guided tour of Florence Duomo complex, including museum, baptistery, crypt and cathedral, in English, Italian, Spanish, French, German or Japanese. Travelers Reviews about Florence: Duomo Guided Tour and Reserves Cupola Entrance? This tour has 4.8 out of 5-stars on Get Your Guide. On TripAdvisor travellers have given the tour a full 5 out of 5-stars. Comments say that this is a mist do in Florence and the best way to see the entire cathedral. Reviews agree that the tour is work the money. Travellers say that tour guides are excellent. Tickets should be presented in print or mobile form. Cancelleations should be made at least 3 to 7 days in advance to recieve a refund. Reservation times to climb to the dome and bell tower cannot be changed. A dress code applies, knees and shoulders must be covered to enter the cathedral.